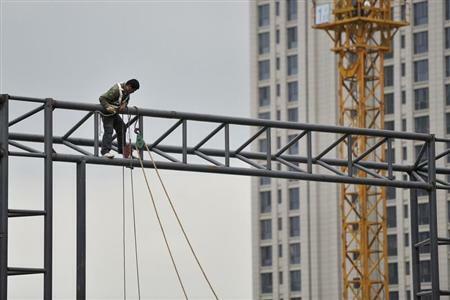 (Reuters) - The world economy can expect steady growth at best over the coming year, but any rapid slowdown in China as it tries to rebalance its economy could upset the still-unsteady progress, Reuters polls showed. Growth in the United States, the world's largest economy, looks set to outpace its peers, with Japan and the euro zone still lagging and emerging markets - particularly Latin America - in for a challenging year. The poll results suggest that exuberance in financial markets, especially stock markets, may have been overdone in the past few years on expectations for a robust pick-up in global growth. With a few notable exceptions like Britain, developed economies are also showing scant evidence of an imminent and significant improvement in hiring, particularly so in the euro zone and the United States. "It is important to stress that the pace of expansion in the advanced world will remain modest, keeping inflation low and disinflationary risks high in countries with considerable economic slack," Craig Alexander, chief economist at TD Securities, wrote in a note to investors. Overall, the world economy is expected to grow 3.4 percent this year, just a tad below the 3.6 percent projected by the IMF and the January Reuters poll. That is still better than the 2.9 percent clocked last year. With so many economies at best humming along at a modest rate of expansion, much will depend on China, the world's second-largest economy, which for many years was the driver of global growth. First-quarter growth there weakened to its slowest pace in 18 months, reflecting signs of waning momentum, although the slowdown has been widely expected. What remains more of an unknown is how China will manage to ease itself off a credit-fuelled investment binge since the financial crisis hit and how well it will deal with the overhang and subsequent pressure on asset prices. Indeed, a significant slowdown in China is the biggest risk to the global outlook, according to a majority of economists and strategists who answered an extra question. "China growth risks look more serious now than last year," Johanna Chua, an analyst at Citi, told investors in a note. Perhaps more critically, a sharp slowdown in China would likely push down commodity prices, which in turn might pressure stubbornly low inflation rates in the euro zone, the world's biggest trading bloc, the United States, and the rest of the world. The euro zone, which is already battling low inflation and outright falls in prices in countries like Greece and Spain, appears most at risk. Although the poll suggested deflation itself looks unlikely, low inflation will remain widespread and persist for several years, made worse by a strong euro. The story is similar for the southern euro zone stragglers, where jobless rates are expected to remain high. Europe's heavyweight economies, Britain and Germany are set on course to lead the way in terms of economic growth. Growth prospects for emerging markets have dimmed in the latest polls, defying recent market optimism. After clocking growth of 8.5 percent in 2011, faster than anywhere in Europe at the time, Turkey's economy will grow just over 2 percent this year, well below growth in the United States. In Latin America, forecasts were downgraded across the board. Argentina and Venezuela are expected to be in recession, and Brazil was forecast to grow by less than 2 percent - its fourth straight year of weakness. The region is mainly being held back by local problems, economists noted: dimming confidence in Brazil, rampant inflation in Argentina and Venezuela, and slowing investment growth in Chile and Peru. "Unfortunately, lower growth for the region does not seem to be a temporary event," said Andre Loes, chief economist for Latin America with HSBC. The latest outlook for China and the rest of Asia will be published next week.